A visit to El Calafate was always part of my plan for Patagonia, or rather, it was always part of the plan to see the Perito Moreno glacier. El Calafate is a small town with a touristy ski-resort feel to it, and honestly there isn't much to do aside from see the glacier. Which is why my visit turned into a bit of a sprint. I arrived in the middle of the afternoon, exhausted after the 30 hour bus ride, and checked into my hostel, America del Sur, perched atop a hill just past the main street. The hostel itself was really nice, aside from a terrible fly problem (thankfully it had been remedied when I went back a few days later), with massive ensuite bathrooms and a nice breakfast. AND… hair dryers. (Okay, it had been nearly three months since I had gotten to blow dry my hair - I got a little excited. It's the little things when you're on the road!) 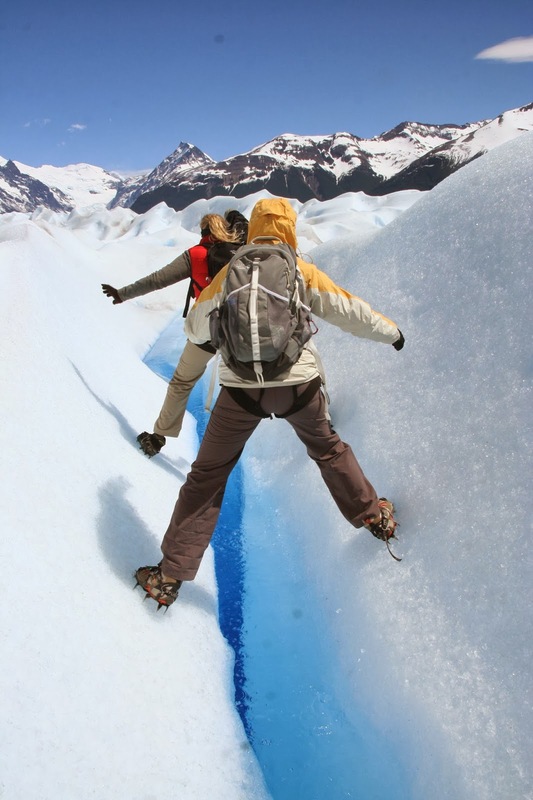 I had originally thought to spend a few nights in El Calafate, but at the urging of friends I booked only two nights, reserving a spot on the Big Ice trip - a trek on the Perito Moreno glacier run by Hielo & Aventura - for the following morning, which also happened to be Thanksgiving. Thanksgiving is one of my favorite holidays back home. As long as I've been working, I always spend an entire week back in Alabama with family, working remotely, playing in a local ultimate tournament with a Thanksgiving feast and attending a charity ball the weekend before, traveling to see extended family and watching football on the holiday and the weekend after. I was a little bummed to be missing out on such a fantastic week at home, so having the opportunity to experience something incredible and unique on Thanksgiving day was a huge plus. I got up early that morning to catch the 7 AM bus for our trek. Thankfully, they picked us up directly from the hostel, and we had a bit of a chance to doze off as we wound through town to pick up the other passengers. Once we finally entered the Los Glaciares National Park, we caught our first glimpse of the Perito Moreno glacier - it was absolutely stunning, a massive wall of blue and white ice. While Perito Moreno isn't the largest glacier in Patagonia (though it is one of the largest), it's definitely the most famous. It's also one of the most accessible, with its proximity to the opposite shore, and it's one of the most active. As one of only a few glaciers which are actually expanding, it's easy to catch chunks of ice falling off the face of the glacier, and there's a constant hum of cracking and shifting ice. Thankfully we were allowed a full hour at the viewing platforms to take in the splendor of the Perito Moreno before beginning our trek. Since we were so early, the platforms were practically empty, but the ice also wasn't as active since the heat of the day hadn't had time to melt the face of the glacier. Even still, we caught a huge chunk of ice falling off one of the sides as we were walking back to the bus! To start our trek, the bus drove us down to a dock, where we boarded a boat that would take us across the lake to the shores running alongside the glacier. We convened at a small lodge, where we were divided up by language (Spanish versus English… though our guide also spoke Italian and German! ), then broken into smaller groups and assigned to guides for the actual trek - my group included two women living in New York that I hit it off with immediately, two from Chicago, three Italians, and another guy who was half-German, half-Italian. We hiked about 45 minutes to get to our entry point, through tall trees, past a small thundering waterfall, with views of the glacier to our side the entire way. We were given crampons and harnesses (I still don't actually know the purpose of the harnesses, but we wore them), and began our walk on the ice. We were incredibly lucky with the weather - we had blue skies the entire day, though we walked through insanely high winds that nearly knocked me over a few times! We hiked up and down dozens of hills of ice, walked through a gap straddling the edges with a bright blue crevice of ice below us, and posed in front of deep blue pools of glacial water surrounded by white hills and grey mountains. We took in the stunning views of ice as far as the eye can see - gentle hills and sharp spikes, highlighted in glowing blue, flanked by mountains on either side. Our guides held us (perhaps that was the reason for the harnesses?) as we peered over ledges and down into massive holes with rushing, winding, tunnels of water. At one point we broke for lunch, shielded from the wind by a small wall of ice, before continuing on to the top of more small ice hills where the wind nearly toppled us over. On our way back, we made one of our last stops at a small cave of ice with a pool of crystal blue water beneath it. It was a gorgeous site, and a perfect way to wrap up a few hours on the glacier. We trudged back to our exit spot, pulled off our crampons (by the way, make sure you wear tall socks or have tall hiking boots if you decide to wear crampons - I had some nice little blisters from the end of the day from stupidly wearing ankle socks! ), and hiked back to the lodge where we had started the trip. We were treated to hot coffee and a nice view of the glacier as we waited for all the groups to return, after which we boarded the boat to return to the other side. An even better way to end a day of trekking on snow and ice and being pelted with wind? Whiskey. As we stepped on board, we were each handed a glass of Famous Grouse whiskey with a chunk of glacial ice as well as a small parting gift - a metal keyring of a crampon and an airplane-sized bottle of Calafate liquor! Since it was still Thanksgiving, a feast of some sort was definitely needed to round out the day. The New York gals were staying at the same hostel, so we planned on venturing to a nice steakhouse down the road called La Tablita. It did not disappoint. We each ordered a "half tenderloin" (probably still 8 oz of meat) and some wine, and we shared gnocchi with pesto, mashed pumpkin and potatoes, grilled vegetables, and a chocolate mousse dessert. It was truly the perfect way to end such an incredible day, and if I was going to be missing one of my favorite holidays back home, it was a pretty good substitute!! The next morning, I packed my bags, headed back to the bus station, and ventured north towards my next stop: El Chaltén. Great post! Thanks for sharing, Jennifer! Thanks! Where are your travels taking you these days? We were so lucky with the weather - you know how it is in Patagonia, always changing!